We have been talking about various different issues involving the lower leg over the past few weeks. To be honest in the majority of cases whether your lower leg slips forward or back the issue still comes down to instability of the pelvis. This can be down to numerous muscle groups surrounding it being weak, dysfunctional etc. 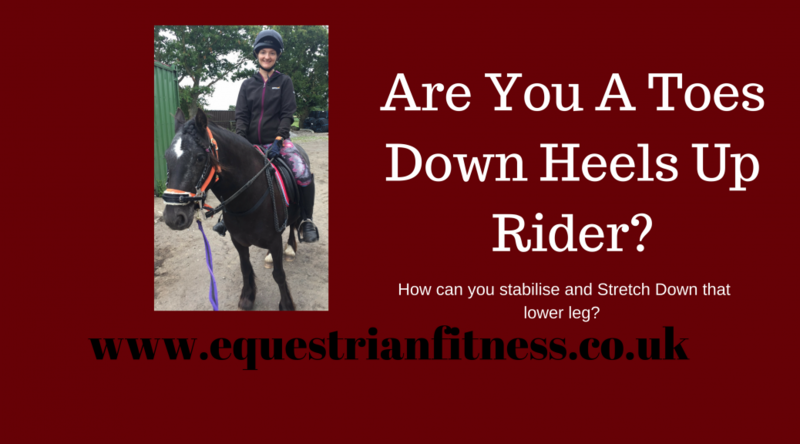 I have dealt with hip stability a fair bit, and to be honest I will refer back to it often as it really can’t be emphasised enough how fundamental it is to good riding. In this instance I am going to focus on strengthening the abductors. These are the muscles of the bottom and outer hip most notably Glute Maximus, medius and minimus along with Tensor Fascia lata. These muscles by their very group name abduct the hip which means they take the leg away from the body-for example each time you give a leg aid you will very subtlety (or perhaps less subtlety if it’s an old fashioned pony club kick!) abduct the hip. They are automatically contracted when we sit on a horse however as discussed previously they can be “over shortened” and “tight” and need to be strong in order to hold our leg in good alignment in the saddle with the knees and feet still pointing forward rather than in or out. They are also vital for good strength and stability in rising trot. If you have ridden a big moving horse you will know the feeling of a wobble at the top of a rise. You will also know that in order to create a forward, active trot the oomph needs to come from your hips in order to activate the oomph in your horse. If you do not have the strength and stability to create this you will struggle to ride forward and may well resort to nagging with your legs-which is more abduction that will cause you more instability……………..
You can do these exercises individually or as a little circuit. You can do them with or without the resistance band. Feel those booty burning lower leg stability gains! 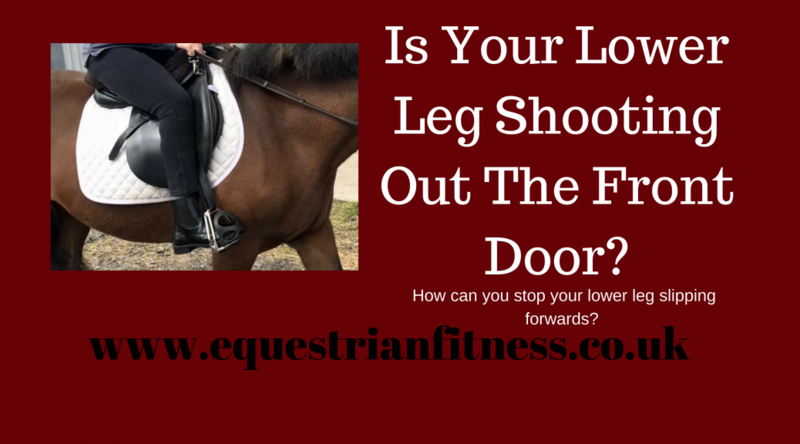 Does Your Lower Leg Shoot Forward? So, final week of lower leg issues before we move on to some strength work to assist with all these problems further. Again there is never a one stop answer for why this may be happening however there are a couple of reasons why this may be happening. One suggestion is that you may be tight in the front of your thigh-your quads in particular the middle muscle of your thigh that Rectus Femoris. This muscle passes from your pelvis to under your knee and therefore crosses two joints-the hip and the knee. The means it has two functions; 1: to flex the hip – this brings it closer to the body so knee towards chest and 2: to extend the knee-straighten the knee. In order to perform these actions it shortens/contracts. When your lower leg is shooting forward this muscle is shortening to extend the knee, if this muscle has a problem causing it to be shortened then it may well be shortening without you wanting it too! Hence lower leg shooting forward. The second issue could be an unstable pelvis. Now I think I say this is the answer to a lot of rider problems and to be honest that’s because it is! In this case if the pelvis feels unstable in order to try and balance itself it will counter balance with something else. Unstable pelvis flexes to balance-you insist on staying upright (good for you) so sit further back-the pelvis sends the leg out for balance instead shooting the lower leg forward (think of hunting and eventing postures over enormous fences)-finishing picture you are sat at the back of your saddle with your toes by your horses ears (might be just me because mines little….) but hey presto you are not falling off so mission complete as far as your pelvis is concerned! Great information I know, but what you really want is the solution! And if you think Hip Stability is your issue try this exercise. Clue-if you find it difficult to do without dropping a hip or wobbling then your hip stability could be improved! 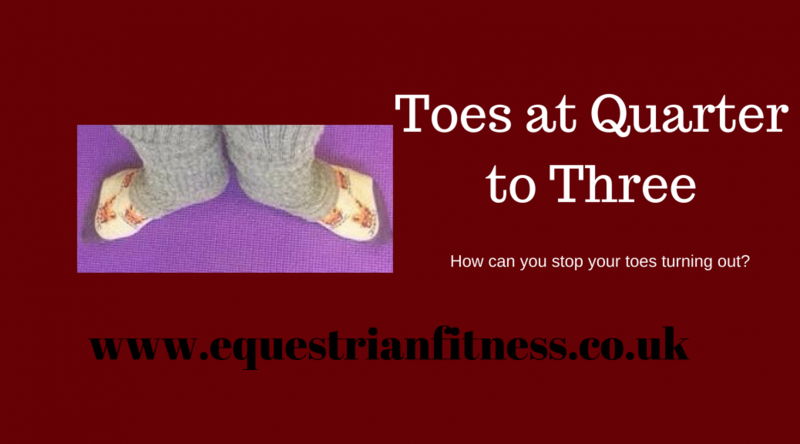 On the continued theme of lower leg problems this week I am going to look at another common problem that is the lower leg slipping back so the heels are pointing up. This can be a couple of things. One I'm going to address briefly is personal to me but I have heard other riders mention this so I think it is important to mention. If you ride a pony or perhaps have particularly long legs (think William Foxx-Pitt) it can feel like you need to lift your heels to give an aid. It's basically a bad habit so if my instructor is reading this -Amanda don't let me get away with this even once on PoppyMay! What you actually need to do is let the heel stretch down but engage the calf muscle and let the aid come from a strong calf. Then you just need to engage and release the calf to give aids not lift up your legs! It takes practice and probably a good nagging instructor but stick with it. *I’m going to deal with strength work very soon so hang in there and deal with the muscles for relaxing first. Why is your lower leg tense? Is it nerves? Do you grip with your knees too? This can also often come from nerves which need to be addressed perhaps with some belly breathing. However sometimes it doesn't stem from nerves -I've seen plenty of frustrated riders being told they grip through nerves when they have balls of steel! Gripping with your knees can also be caused by over active adductors (inner thighs). Think about it; we use them quite a bit when riding so it makes sense that overtime they can become really strong but also then struggle to relax-can smash a water melon but never do the splits! So, in order to help with this problem we need to do two things. If you can relax your inner thigh you are more likely to have a relaxed lower leg but if you need a little more next weeks videos should help you too. Next week we are going to look at the other common issue of lower leg shooting forward before we move on to some lower leg improving strength work-so stay tuned! Last week we talked about awareness of your lower leg and how the position of your foot can impact how it sits. Did you try out the exercises? 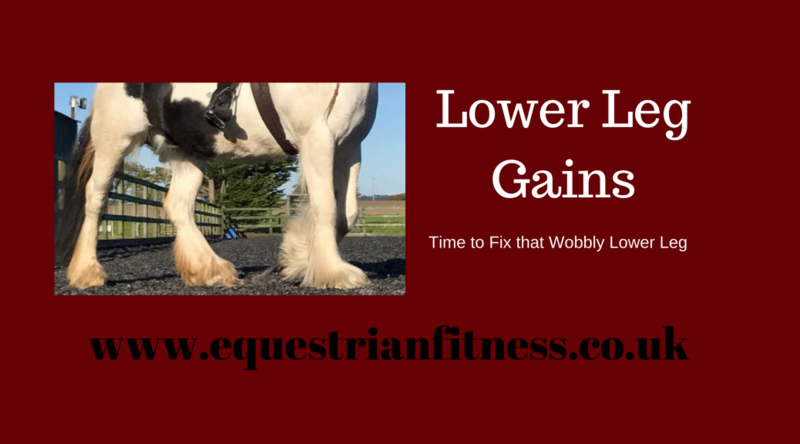 Did focusing on this fix your lower leg woes? 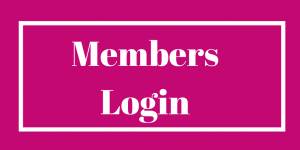 Don’t worry if not you may just need more tools to help you unlock that potential. We will start by looking at some common issues, their cause and of course how to fix them. I will start with Toes turning out. It's frustrating isn’t it; as you have a lovely ride and someone takes a picture and all seems well until you realise your feet are pointing at quarter to three! In most cases this is caused by tight abductors. The abductors are the muscles around your outer hip and bum. These are the muscles that turn your hip out -and therefore turn your foot out! When we sit on a horse these muscles which sit on the outside of our hip are put into a shortened position as our inner thighs (adductors) are lengthened to go around the horse. Due to this continual shortening they can become "over shortened" and unable to relax back down which then travels down the leg and rotates the whole thing. You may find if this is you that you also have trouble getting your knee to stay in contact with the saddle. In order to correct this we need to take a two pronged plan of action. Start with the Anti Spasm exercise I took you through in September. You can also try releasing the muscles with a ball. Firstly directly to the Piriformis which is often a main perpetrator. The Piriformis is a muscle that runs from the inside of your Sacrum (bottom of spine/top of pelvis) through to the inside, top of your thigh. Therefore it can be reached either through the Glutes (your bum) or on the side of the hip/outer top of thigh. And then we also need to look at the other abductor muscles on the outer hip and thigh such as TFL (Tensor Fascia Lata), Glute Medius and the Illiotibial Band/ ITB. This can be done either gently by rolling a ball manually or by using a foam roller.